Vietnam has 3,260 kilometers of coastline but only a few well-known beach destinations. You might imagine that there are some hidden, white-sand gems somewhere. Quy Nhon is exactly that. 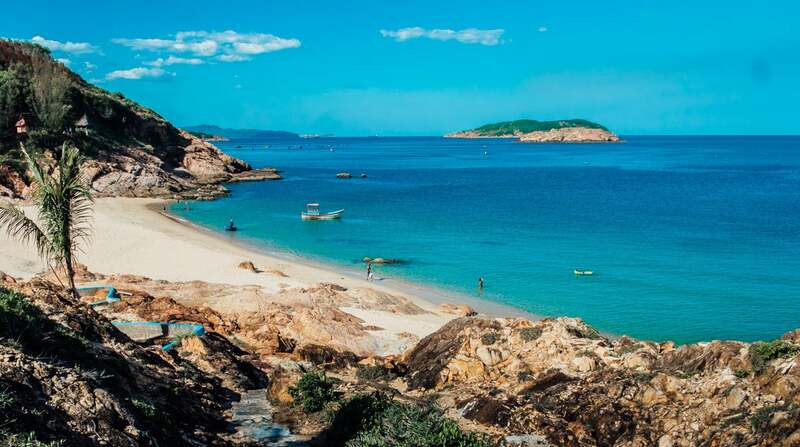 A medium-sized beach town almost exactly between Nha Trang and Hoi An, there isn’t a whole lot else to do in Quy Nhon besides enjoy the beautiful beaches. That’s probably what makes it a lesser-known destination for tourists but the perfect spot for a weekend getaway. 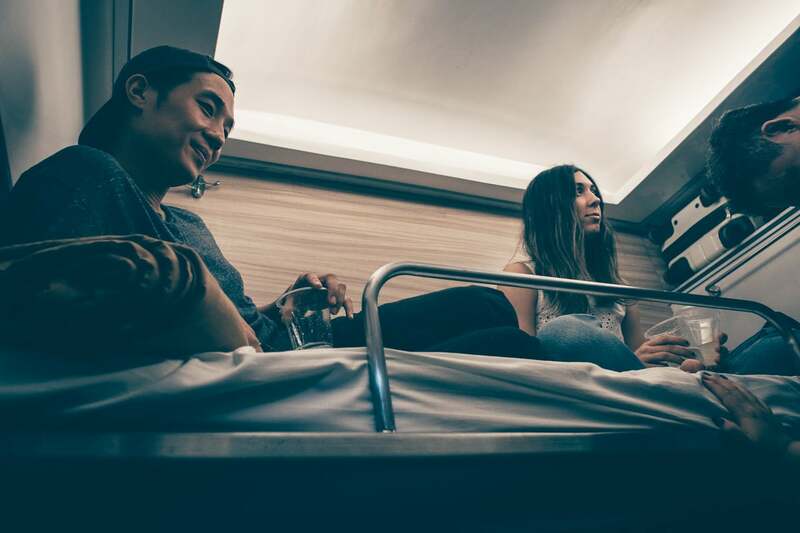 We chose the sleeper train to get there because it was a holiday weekend, meaning the leftover flights were expensive and arrived at awkward times. It can actually be fun if you’re with a group of friends. Round trip tickets for a soft berth (four to a cabin) are about 1.5 million VND. If you’ve never traveled by train in Vietnam before, it’s an experience to watch the seemingly endless hinterlands of Ho Chi Minh City fly by the window. Bring cards, speakers, drinks and snacks. If a few bumps along the way won’t keep you from sleeping, it’s not a bad way to travel. You can fly to Quy Nhon from Ho Chi Minh City and Hanoi. If you book early you can get round trip tickets for 1 million VND or less. If you book during a national holiday or closer to your trip you’ll probably pay double or more. You can also take a Phuong Trang sleeper bus, which is a solid 14 hour ride, and the cheapest option. Quy Nhon is an actual city, with a Big C and everything, useful for stocking up before the train ride back. There are lots of affordable accommodation options if you’re not looking for seclusion. 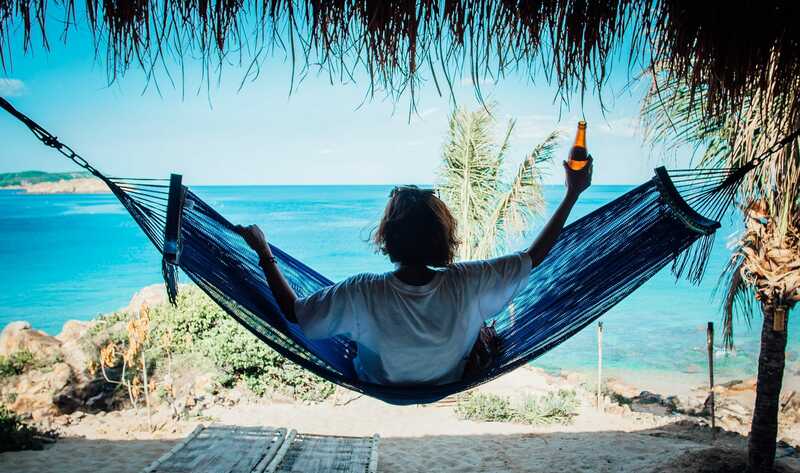 For a true getaway, the best places are about half an hour outside of town on or near Bai Xep beach, ranging from backpacker budget to midrange and high-end, each with private beaches. 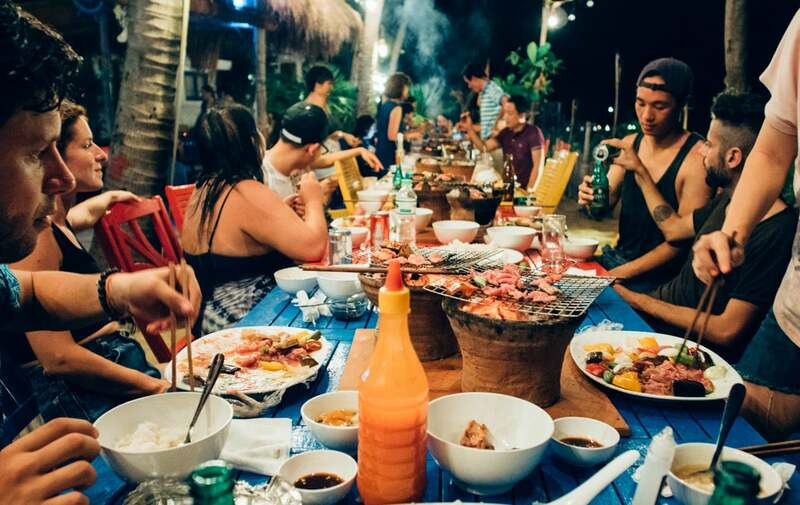 We stayed at Life’s a Beach, a collection of bungalows plus a little bar right in the heart of the fishing village. It has a dorm, doubles and private bungalows. We rented out the whole dorm but a bungalow would suffice for 4-5 people. The path through the fishing village is only wide enough for a motorbike so your cab will drop you at the top of the hill. “Authentic” is an overused term for travel but, as opposed to a usual resort, wandering down through a lively fishing village to reach your beachfront bungalow is a nice way to ease into a weekend away from the city. Down a little ways on the same beach is AVANI resort. It’s five star with all the amenities, including a spa. Many say that it doesn’t warrant it’s five star status, though there are newer high-end resorts in development such as a rumored Anantara Resort adjacent to the AVANI next year. Beyond AVANI is Life’s a Beach Backpacker. It’s a no-frills place made of mostly concrete, but it makes up for that by being set on a hill overlooking the sea and their nice private beach. It has a restaurant and bar with hammocks, very chill vibes. Life’s a Beach has a restaurant and bar built in. If you’re not picky they have basic breakfast stuff on the menu. In the afternoon the hotel arranged for a boat to take us over to Life’s a Beach Backpacker, where we swung in hammocks, beer in hand, and played cards while waiting for a family-style Vietnamese lunch. In the evening we signed up for the BBQ-it-yourself dinner set up on the sand in front of our hotel. The only complaint was that we couldn’t finish the heaping plates of raw vegetables and meat. They had happy hour all night for rum and cokes and beer. The next day for lunch we went into the fishing village around Life’s a Beach and tried banh xeo and bun cha ca. The bun cha ca is worth finding. There’s a woman who makes it in her house and serves at a single table on her porch, so it’s difficult to give directions. It’s less than a five minute walk up the path from the hotel, on the left. She usually makes it for the morning market, only on certain days, so go early (10 am) and ask around for bun cha ca or whatever is cooking that day. Other options: AVANI has a restaurant and bar as well, with five-star prices, or you could go into town and check out the seafood street food scene or get Western food at Athena’s. Nguyen Nga center in town is highly-rated on Tripadvisor. It’s a shop and cafe run by an organization which supports people with (mostly physical) disabilities to build skills and make a living through handicrafts and other sustainable means. Like a smaller version of Nha Trang, there are towers built by the Cham people in the area (Thap Doi), which would date from between the 7th and 12th centuries (probably a thousand years old). It’s on the other side of town from the secluded beach hotels so you’ll spend at least an hour in a cab round trip. If you’re into seeing off-the-beaten track historical sites, it would be worth the visit. Perhaps especially during the heat of the day, when being on the beach is not as fun. Otherwise: it’s all beach. Bring a frisbee, beach volleyball, or whatever else you like to do on the beach. A good book, board games. Beware that the sand is absolutely scorching in the middle of the day, you’ll be sprinting to the water without shoes. There’s a great view of the sunset from any of the spots near Bai Xep, just pick your hammock. After dark the beach lights up with bonfires. You can get wood from the reception at Life’s a Beach. There’s also a pool table and board games at the bar, which stays open as long as people are up, it seems.